Thank you to Meridian-Pacific for the use of their maps. As you can see there is a 10% registration advantage for Democrats. However, DTS voters will lean more conservatively in this race. On top of the DTS voters the Orange County cities have a higher turnout level than the Long Beach portion of the district. In other words you have a very competitive seat on your hands. Recently Probolsky research conducted a poll on behalf of the DeLong campaign that showed a good chance of a close race that slightly leans towards DeLong. You can see the memo that went out here. These results show that DeLong is in a slight lead for the seat. Alan Lowenthal has just under $217,000 after the primary and Gary DeLong has about a $100,000 lead with just under $317,000 after the primary. This race is extremely close in about every aspect from voter registration, fundraising, and campaigning (so far). This entry was posted on September 11, 2012 at 2:16 PM	and is filed under 47th Congressional District. Tagged: Alan Lowenthal, Gary DeLong. You can follow any responses to this entry through the RSS 2.0 feed. You can leave a response, or trackback from your own site. Generally I think most of your calls have been good so far, but here I think we will have to disagree. DeLong needs to get out more the the GOP than Lowenthal need to get out Dems. The district is +12(D) and unless DeLong can make a case that he will not be yet another rubber stamp GOP vote “against Obama” the leanings will be to support the Dem ticket. This is why DeLong has been making a push to the middle (upsetting OC GOP Teaparty members) to attract the middle, but with a reminder to the voters that the GOP in Congress is the reason there is no Jobs Act, the reason that the credit of the US went down, and that when their entire goal is politics and not the people, when they have had over 14 votes on women’s social issues and not one vote on a jobs bill, etc. Lowenthal can make a good case that voting Obama and then DeLong is ensuring more gridlock for the administration, and if you are going to vote for Obama-DeLong, you might as well vote for the Ryan/Romney ticket. Mathews never had a chance in the primary, and the goal for Lowenthal was just to make it to the General (look at the abysmal spending and you can see that). In a district with a +12 shift to the (D), the primary was almost 50% GOP voters. That means that a great number of the Dems stayed home. They won’t when they are voting in the General. And that is the reason that I think the call on this one is more wishful thinking than looking at the hard numbers. DeLong has to move to the center to appeal to DTS voters. In doing so he will lose support from a small percentage of the teaparty wing of the GOP. But at the same time, once the RNCC starts to flow support into the district Lowenthal gets to tie DeLong to the “Republican Agenda” and that includes everything from their far-right pro-life and anti-marriage-equality social stands to the Ryan/Romney plan to make medicare a voucher system, make social security a welfare program for wall street, lower taxes on the wealthy and raise them on the working class as well as their refusal to compromise and stall the efforts to recover the economy (that is how DeLong will be framed if he takes RNCC dollars, and he knows it). So, where does it go from here? It all depends on how much the GOTV effort does, and by whom. If Ryan/Romney remains so down in excitement, and the numbers show no chance, then expect a lower (R) turnout. The numbers show the key problem that DeLong will have to overcome. 4 or 5 points, it may be possible, but @ 12 DeLong needs a massive (R) turnout, a depressed (D) turnout and to pull over 70% of the DTS that show up. Not a very good outlook. On the other hand, the voter turnout is likely D+4, which means all DeLong has to do is receive 1% or 2% of the Democrat vote and 50+1% of the Independent vote. He’s a moderate Republican in a moderate district who has earned endorsements from several Democrat elected officials and beat Alan in several Long Beach districts that had a 9 point Dem advantage. 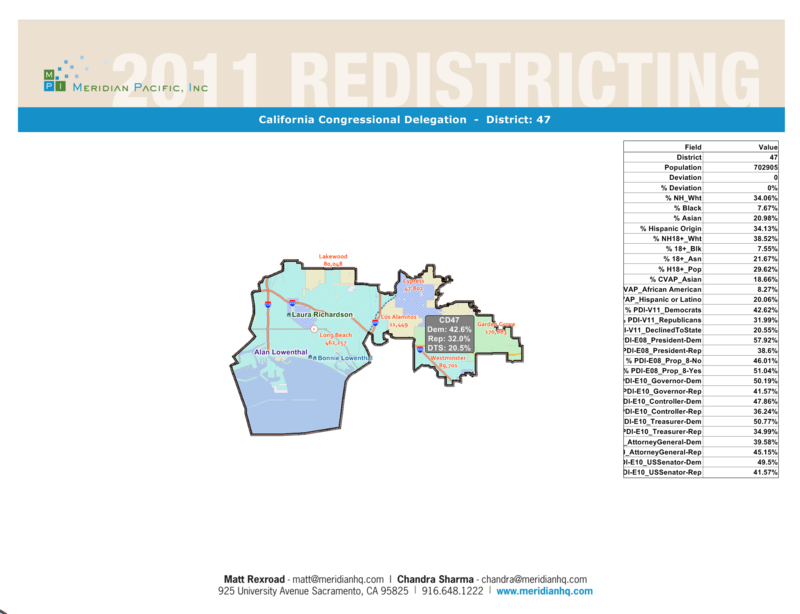 Lowenthal is a very liberal Democrat in a moderate district. Additionally, Cooley(R) beat Harris(D) by 5 points in this district, and according to the California Target Book the R’s beat the D’s by 4 points in the 2010 Congressional races. Things look very good for DeLong.